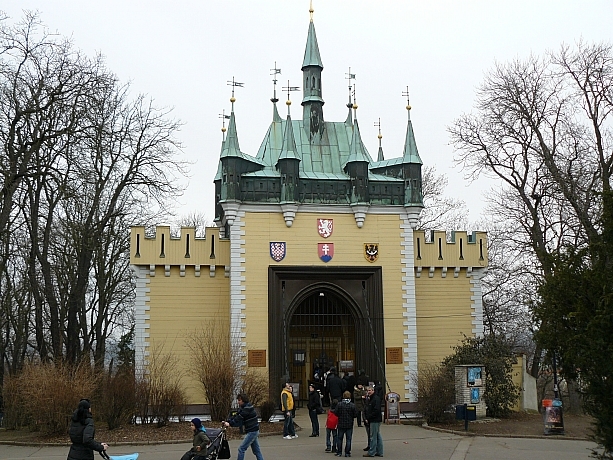 The labyrinth on Petøín Hill was built as the Czech Tourist Club’s pavilion at the Prague Jubilee Exhibition in 1891. It originally stood near the corner of the Industrial Palace at Prague’s Výstavištì exhibition grounds, but two years later it was relocated to Petøín Hill. A mirror labyrinth leading to a dioramic picture was installed in the right section of the building in place of a panorama of diapositive slides.The second room, known as the Hall of Smiles, was furnished in 1911 with various convex and concave mirrors, which humorously distort people’s reflections. The labyrinth has 31 ordinary and 14 twisted mirrors, but originally there were only 35. The wooden building was completely refurbished in 1975.